The color drained out of Lori’s face when I asked her to describe her relationship with money by drawing it. She looked at me like I was crazy-- then looked at the art supplies, then glanced out the window. I focused on making a pot of peppermint tea for us, and when I returned she was working intently on her image, purple, red and black flying across the page. When finished she looked up and smiled at me, shaking her head. 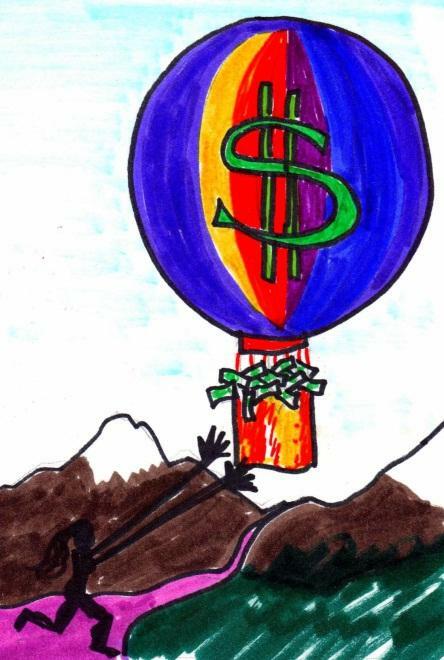 “Oh, my god!” she said, laughing, “I had no idea I felt this way!” She had drawn a hot air balloon full of money rising into the air, and a tiny little stick figure running after it. Using creativity to discover and heal your relationship with money is powerful, insightful and transformative. Ultimately it helps you step outside of your money story so that you can gain perspective, have a good laugh, and begin the process of choosing a new healthier way of being. 1. Draw or find an image that reflects your current relationship with money. Write about what you notice, what surprises you, where you are in the picture. Then draw a new image representing how you want your money relationship to feel. Remember to make sure that you AND money are in the picture! 2. Get an egg—a real egg—and decorate it, give it a name and personality. This represents your nest egg, that which provides financial stability and protection from catastrophe. Carry this with you for a week, being careful not to drop or break it. What if you treated your money with this same level of love and respect? 5. Create a sacred space for doing your money – make an altar, use a special candle, light incense, surround yourself with money positive images—and give thanks for what you have and how you show respect for the money in your life. Create a little ritual for loving yourself up after paying your bills—a nice glass of wine, some dark, yummy chocolate or a bubble bath. My wish for you is that you learn to see your creativity as a gift that needs training wheels for new terrain. There is nothing wrong with you. You aren’t missing the money gene. It is possible to lighten up while taking your money more seriously. You are worth it. To pre-order your books and help with Luna’s Kickstarter campaign, click here. Bonuses at all reward levels! Ends March 2nd. This piece I'm calling "Laundry Lines" is 6"x6" with acrylic and ink on panel. I started out thinking the colors were going to be SO different. 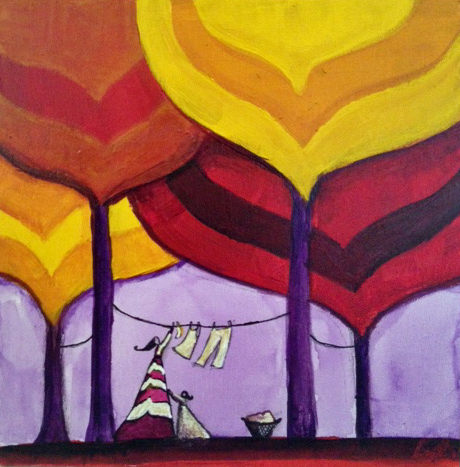 It was going to be a more wintery scene, lots of blues and purples, but it went in a very different direction. I love being surprised as I create. Yellow isn't a color I use a lot, but it fits so perfectly with the light theme this month. I hope everyone in the Northeast survived the blizzard. We got just over two feet of snow, but the craziest part was the snow drifts. They made banks up to five feet high in some spots! At the end of each month I will announce the totally optional theme for the following month. 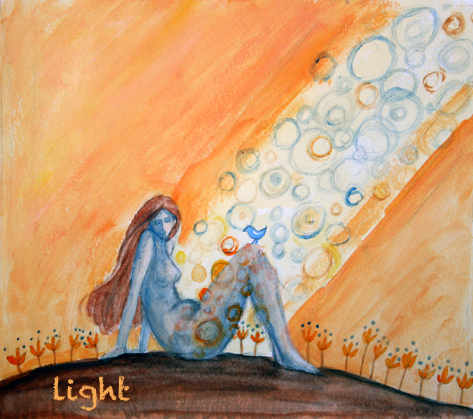 For the month of February 2013, the theme will be Light. As always, this month's theme for the Creative Every Day Challenge is totally optional. Use it if it inspires you, continue being creative every day in your own way if it doesn't, or do something in between. You can sign up for the 2013 Creative Every Day Challenge anytime. More info can be found here and the sign-up page is here. *Get out in the sunshine. I know it may be cold in your world, but the sunshine is good for you. Let it inspire your work. *Write about how light or lack there of impacts you. *Fill your space with different kinds of light as you create. Light some scented candles. Let the atmosphere inspire you. *Paint with the colors of the sun. *Draw and/or doodle with a light-hearted attitude. Have some fun! *Create something that will light up someone else's day. A special meal, a sweet valentine, a bunch of gerber daisies? What makes you feel lighter? Movement, releasing your thoughts through words, painting, talking to someone? Add more of what makes you feel light this month. p.s. The art above is adapted from Spring Thaw. Prints are available here.